Hi. ..... uh... Hi. I'ma Meat Whittler. That's what I do. I ... uh .... Whittle Meat. You.. uh. .. uh.. can whittle all kinds of meat. 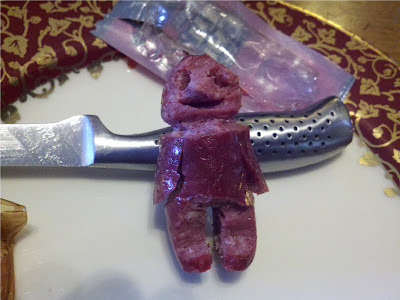 Meat whittling is a proud and ... uh .. proud tradition. My great grandpaps ... uh ..whittled meat for the war. 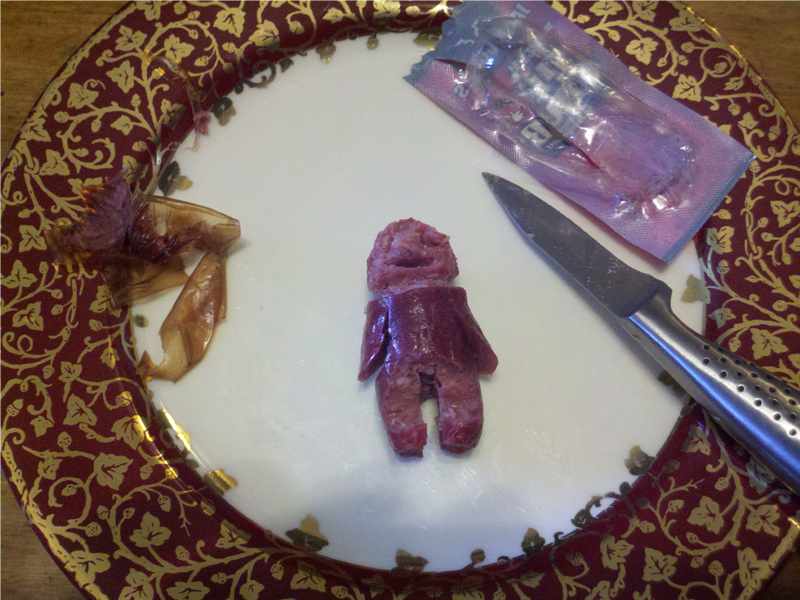 My grandpaps won my ... uh .. grandmams heart with a fine .. uh ... whittled meat. My daddy .. uh .. well, my daddy .. uh.. well, he... painted meat. It's OK, while he was living, he would .... uh ... paint my meat whittles. Steakses and roastses make .. uh... great ... uh... carving blocks. But sometimes I like to branch out with other meats. When I went to the corner store today. I found a meat .. uh ... treasure. 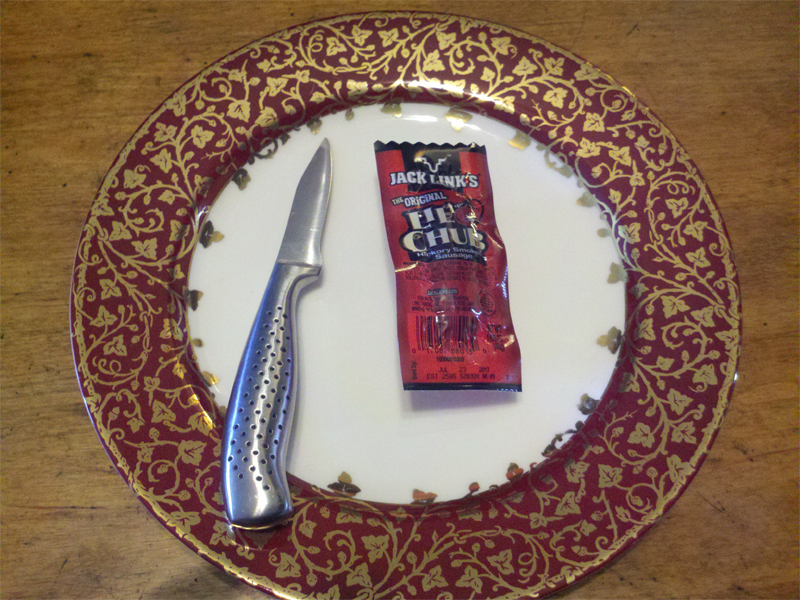 It'sa Jack Links Lil' Chub. 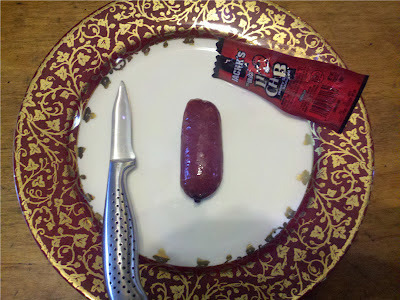 A tiny Summer Sausage. 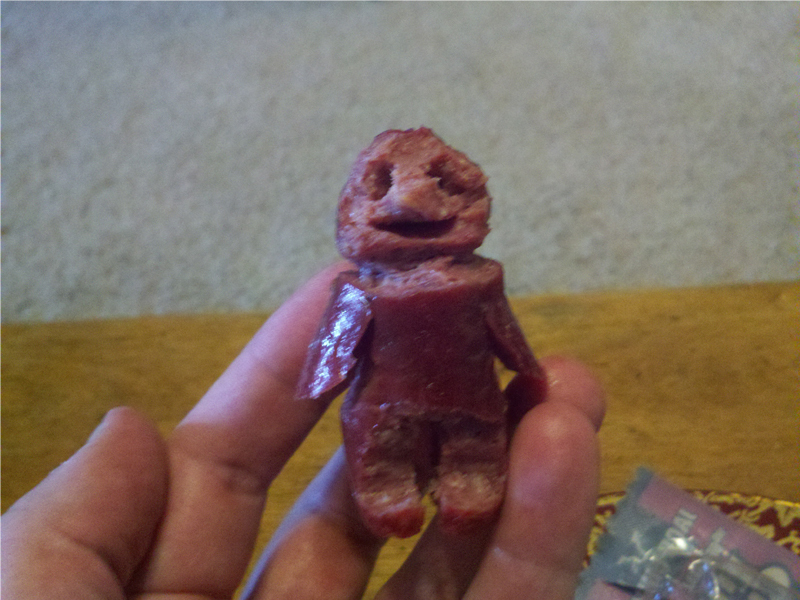 Summer Sausage makes for good ... uh ... whittling. 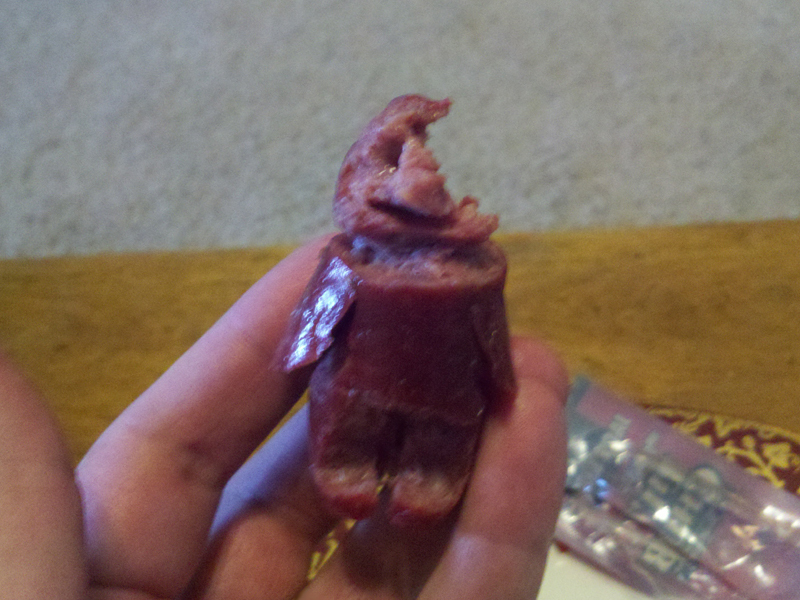 See how the .. uh .. summer sausage is nicely shaped. They are easy to ... uh .. whittle. The meat is tender and fatty. I use a freshly sharpened ... uh .. pairing knife. Like many .. uh ... sculptors, you have to see the shape and free it from your medium, with your tools. I saw Michelangelo's ... uh ... David, when I looked at this sausage nubbin. Do you see how I skillfully .... uh ... whittled art? If my daddy hadn't .. uh ... asphyxiated himself, he would paint it and it would look exactly like a miniature ... uh ... person. It'sa .. uncanny isnt it? Like a miniature .. uh .. meat baby. Don't let it go to waste. Half the fun of the whittling is the ... uh ... eating. Until next time! Keep whittling your meat!